You need a quote quickly and that’s what we do. We deliver a firm quote for most hazardous waste transportation and disposal projects within 72 hours. AET is committed to being the most reliable, responsive, and safest partner for our clients. In an industry dominated by large businesses, we remain a small firm with a competitive edge based on extensive technical and field expertise, reliability, and accuracy. 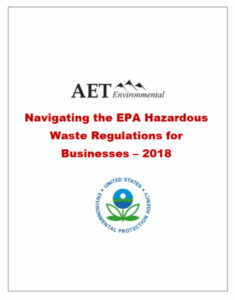 AET’s flagship service, hazardous waste disposal, assists customers with treatment and disposal needs for their bulk and containerized waste. AET is your hazardous waste experts when it comes to industrial, hazardous, toxic, medical, and radioactive disposal. AET project teams support customers in a variety of onsite services: lab packing, scheduled and unscheduled maintenance turnarounds and dozens of other activities specific to particular industries. Our experienced field service crews perform these time critical services efficiently and effectively so that you get back up and running as quickly as possible, minimizing downtime and lost production. AET performs RCRA compliance activities such as training, satellite accumulation area inspections, proper labeling, and waste pick-up services. Subsequently, we collect, classify, segregate, lab pack, bulk, label and package hazardous, industrial, medical, low-level-radiological, e-waste, and universal waste. In just over 25 years, we have become a trusted business partner to thousands of customers. Providing over 3,000 clients with practical, timely solutions for waste management, remediation, and compliance. Our experience equates to successful completion of projects in all 50 states.